Roxburgh is the overlooked site of one of the most important castles in Scotland. Along with Edinburgh, Stirling, Dumbarton, and Berwick, Roxburgh was fought over by the English and Scots more times than any other. The creation and capital of King David I, the site is huge, easily located and accessed, yet many visitors will never even know it is there. There are a couple of reasons for this. It isn’t on the main tourist trail, it’s in the Scottish Borders, just west of Kelso on the St. Boswells road. There is also not much left of it standing, and the majority of the upstanding masonry is on the opposite side of the site to the main road, so only two pieces of wall can be seen from the road, which runs very close to its base. However, there are also no signs, and no access paths, although there is a small layby at the western end of the site. I thought that I would make sure that one of my earlier castle visits for my blog would be Roxburgh. I felt that I should try to do some justice to this hugely important site. So, on my way home from holiday, I stopped off in the little layby, looked at the nettles, put some jeans on, and set off down the track. 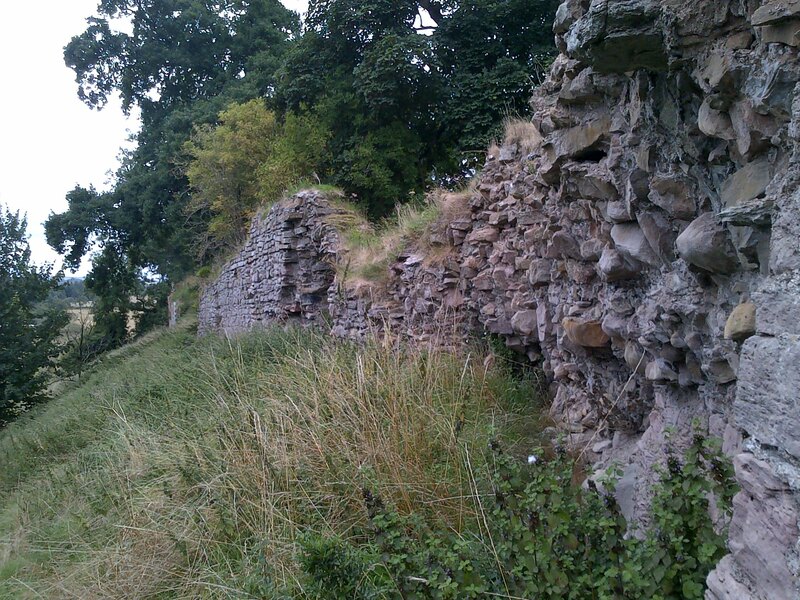 It quickly became apparent that Roxburgh Castle – even today – is not an easy nut to crack. 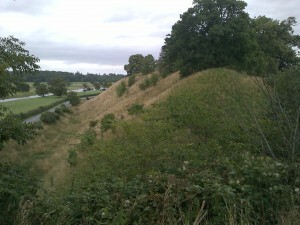 Facing the track, and at the western end of the castle, is a very tall, steep sided crescent shaped earthwork, which obscures the main castle mound behind. Climbing to the top of this mound through nettles, thistles, and what may be giant hogweed (look it up – it’s dangerous to health) I was able to see that it was separated from the main mound by a deep ditch to the rear of this crescent shaped redoubt, the back slope of which was too steep to climb down. So I was forced to walk along the edge of the redoubt which sloped southwards towards the Teviot side. (I should point out here that Roxburgh castle lies between the River Tweed to the west and the Teviot to the east, the two meet at Kelso). When I got down to a level where I could negotiate the slope, I climbed down into the ditch, where I disturbed a couple of deer, and had to look carefully to establish a safe way to climb up the castle mound proper. Climbing a steep slope diagonally isn’t easy at the best of times, and this definitely wasn’t helped by the overgrown state of the site, avoiding plants that were out to hurt me and a very strong wind! However I did get to the top of the slope without falling down, which I was relieved about. To my left, the castle mound rose quite significantly, towards a bramble covered high point, and as the space between was solidly covered by nettles, I chose to investigate the Teviot (eastern) side first. There are a number of pieces of wall along this edge of the ridge that the castle is built upon, all of which stand to at least twelve feet tall, and are several feet thick. More than one of these surviving sections contain putlog holes – gaps in the masonry left by scaffolding when it was built, and there are the remains of two gateways which have been robbed of the good masonry. They are built close to the edge of the slope, making it difficult to appreciate them properly, and inside the ground does lope upwards towards what was the centre of the castle, which was very heavily overgrown. At the northern end of the second long section of wall, there is an angle which would suggest that parts of the summit have fallen into the river if the wall continued in that direction. Certainly this is followed by a complete lack of walls until one reached the northern end of the ridge. Here are two sections of wall, one of which is clearly the remains of a semicircular tower which projected from the wall with a rectangular section to the inside. The rounded room was vaulted. 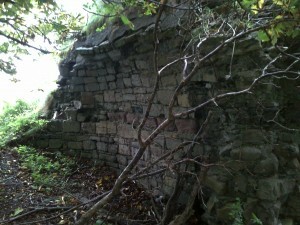 Just outside it is a piece of wall which appears likely to have been part of a gatehouse. Beyond this, the ridge slopes down towards a round hollow, overgrown by trees, and then a deep ditch which is alleged to have joined the two rivers. The slope at this end of the ridge, the furthest point from the layby, is gentler, and therefore the logical place to ascend to the castle site; however it is separated from the road by a stone wall, and I didn’t see a gate. The western (Tweed) side of the castle is defended by a deep ditch which lies between the ridge and the road. The three small pieces of masonry which survive are part way down the slope, again suggesting that the summit may have partially collapsed on this side. Between the northern end and these pieces of masonry, the ground level rises steeply again, with two summits that give the impression of mottes, with a regular rectangular area below in the centre of the ridge that is not apparent from the Teviot side. Indeed, from here it can be seen that at either end of this rectangular area is a tall bank, and to the south of the southern bank is a deep ditch, beyond which the ground rises steeply again, to the bramble covered height I mentioned earlier. Continuing around, it is clear from this side that this brambled area slopes steeply down to the southern end of the ridge, and terminates with a level area that faces the steep sided redoubt I climbed to start with. A further section of walling can apparently be found at the eastern end of the southern bank, but I didn’t investigate this through the trees and other vegetation. Climbing back down the way I had entered the castle area, I was tired, and in quite a lot of pain from the stinging nettles and thistles. I was disappointed by the lack of care and attention given to this site, although if it is giant hogweed I saw, there are a number of legal issues involved in its eradication. Nasty stuff, as I said. Roxburgh castle first appears in the records in the 1120s, where it seems likely the main structure consisted of a great tower, or donjon, plus a walled courtyard. There was also a chapel dedicated to St. John. It seems likely that this occupied the central rectangular area of the ridge, although this is obscured by the later use of it as a fort by the English during the “Rough Wooing” in the 16th century. The history of the castle is long and bloody, and I intend to do this justice in a later article, but here is a very brief version. It was ceded to the English by William the Lyon, captured by Sir James Douglas in 1313, was ceded to the English in 1334, and was Edward III’s base in that year, captured by Sir Alexander Ramsay c 1340, by the English again in 1346, and the by the Earl of Dunbar in 1385, and was back in English hands shortly afterwards, to be besieged by the Scots unsuccessfully and repaired by Henry V in 1417. In 1460, King James II was killed when besieging it, after which the castle fell and was destroyed. 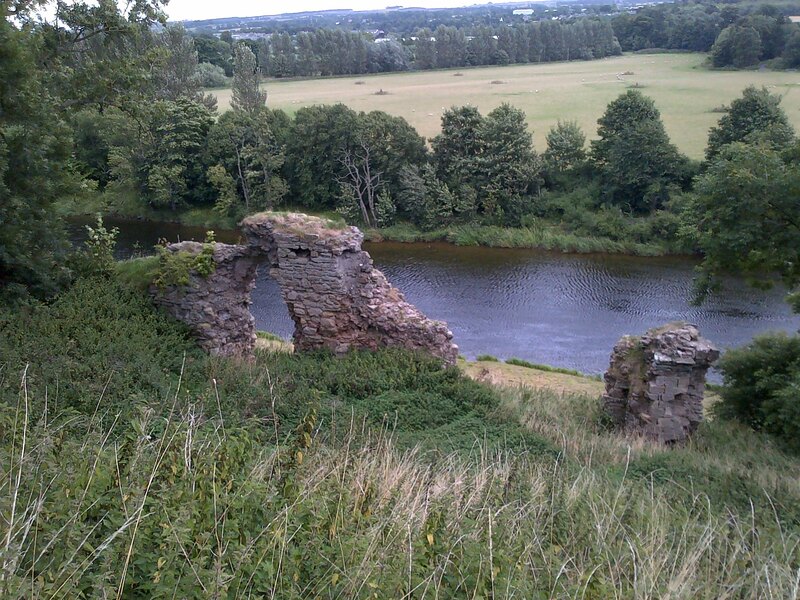 In 1488 the ruin was granted to the Kerr family, whose seat at Floors Castle can be clearly seen across the Tweed from the castle site. The castle was never rebuilt, and when examined by the Earl of Hertford in 1545, he reported it was altogether ruined and fallen down, before building the new fort on part of the castle site. The peace treaty of 1550 between England and Scotland led to the demolition of the fort at Roxburgh. The site has never been reused. So, if you want to visit Roxburgh – be careful! It’s not easy and the remains are difficult to interpret when on the ground. I hope that in time this will be remedied, but in today’s climate, I guess people have higher priorities.